I’m not even doing any actual Christmas knitting this year, but I’m knitting like I am. This week alone, I’ve finished 4 projects. 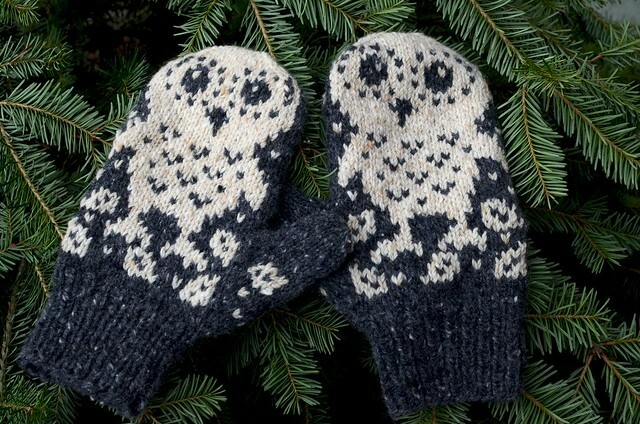 I think my favorite is this pair of mittens. I changed these a bit to suit my fit taste and the yarns I had on hand. Without even realizing it, I chose an Aran weight yarn for the contrast color. It looked like it was the same diameter as the charcoal, but it’s nowhere near as squishy. So, I ended up with a larger gauge and figured I’d line the mittens. Since the mittens were quite large and I wanted them to stay on well, I cast on fewer stitches (4/5) for the ribbing and increased before I started the colorwork. They’re actually really comfy like they are and stay on fine, so I think I’ll leave them as they are. Do you do like I do and use a larger needle for the thumb? I could see in the pattern photos that the sample knitter had the same issue that I do- knitting a very small circumference makes for a much tighter gauge than knitting a larger one on the same needles. I went up half a needle size for this pair and could have gone up more. I went up two full sizes on mittens I’m currently making and that did the trick perfectly. 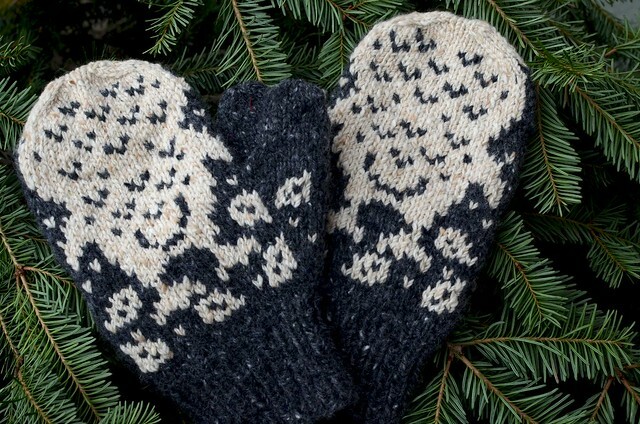 The pattern is very fun to knit and the product couldn’t be lovelier. I recommend it! The mittens are shown laid out on our Christmas tree, which we cut yesterday at the coolest farm. 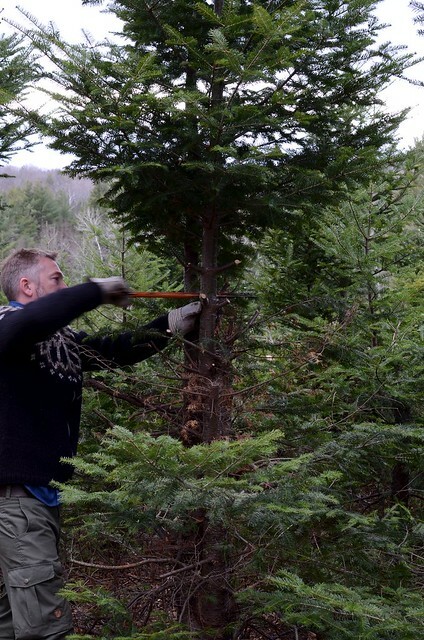 The people at Pieropan Christmas Tree Farm practice “stump culture” to grow trees repeatedly from the same stump. Some of their stumps are more than 50 years old! Isn’t it strange to see someone cutting a tree that starts at eye level?! It was so interesting to look at the landscape that’s created by these trees growing on trees.